Aurea Hostel is a friendly hostel that offer shared rooms with excellent structure in a property with social area, living room, study bench, wifi, cafeteria with kitchen, pub, games room (with cinema), space for events and workshops, swimming pool, large changing rooms, Personal hygiene supplies, guidance for roadmaps, and trained and bilingual staff. Our beds have reading lights and individual sockets. The Áurea Hostel located in a privileged area, easy to reach and close to important points of interest for those who visit São Paulo as we are located to the south of Bela Vista east of Jardim Paulista and west of Ipiranga, it's a dynamic area of the city it's a wealthy area and it comprises some of the most famous symbols of São Paulo, such us Ibirapuera Park, the Obelisk and Mausoleum of the heroes from the Constitutional Revolution in 1932 and the 'Monumento às Bandeiras'. Our property has 62 beds, in 12 spacious rooms (2 suites), and can be shared or private dormitories, with options of suite and common bathroom. The social area includes a living room, convenience store, baggage room, Pub, lounge, game room with cinema, dining room with full kitchen, pool with deck, changing rooms for women and men in an area of 570 m2. Excelente Hostel, pessoas maravilhosas! Voltarei! Excelente lugar para ficar! Próximo ao metrô, museus, Ibirapuera, restaurantes etc. A área comum é ótima, com ping-pong, totó, sinuca, cinema, piscina, bar... Tudo muito limpo, café da manhã gostoso (pão, frios, frutas, bolos, sucos, leite, café, granola) e um staff muito receptivo e disposto a ajudar. Ficaria novamente com certeza! Nice place, good breakfast and good location. 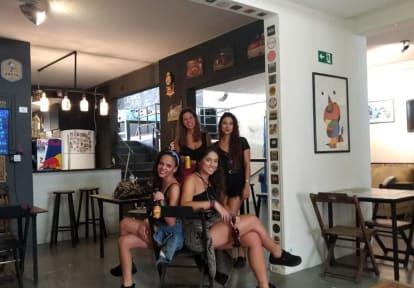 Hostel simples, sem ambiente de hostel e com instalações não muito bem cuidadas. Alguns funcionários simpáticos, mas não estão instruídos a fazerem mais do que o básico. Fui acordado algumas vezes por uma criança correndo com um cachorro pelo hostel. Limpeza dos banheiros não muito frequente.